Actually, the title is not right - Amateur Nikon is not about objective truths (I don't believe in such a thing), and there is more than one way to good results. Perhaps a better title would have been "Doing HDR another Way". This result is so hideous, I can't post it online without marking it with a big red 'X'. And yet, you see photos like this disturbingly often. For the life of me, I can't understand why would someone process an image like that and like it. I assume they like it, if they post it online and share it with friends. And who am I to tell them or you if you should like something or not. If you process your HDRs like this and you like them, well, all the power to you. What's different here? It still is a "punchy" image, with vivid colors, bright shadows and detailed highlights, and a healthy amount of midtone contrast. Let's compare the histograms of the two images, and see what's going on. 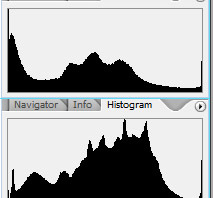 Can you guess which histogram belongs to which image? On the image on the top, white and black are all but lost in a disgusting sea of grey. Notice the histograms and watch how on the bottom image the midtones depict a far smoother transition from black to white: most of the information is present in the crucial midtone area; conversely, on the top image, the histogram looks eroded, a few steps away from being an actual flat line. 1) Always know what it is you're trying to achieve. Simply processing some images quasi-randomly through some HDR software is senseless if you don't have a vision and a plan. 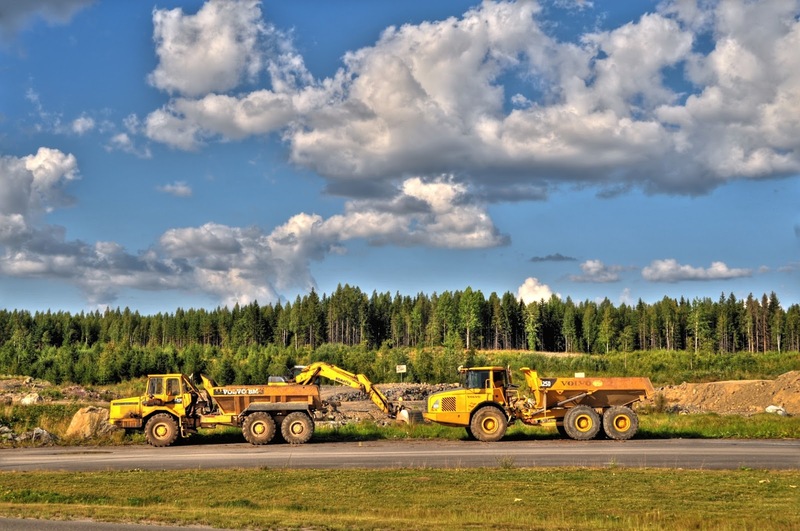 - Are you using HDR processing to capture an excessive dynamic range of a landscape scene? - Are you using HDR processing to present e.g. an industrial scene (although its dynamic range is still within the limitations of the sensor)? There is an undeniable steam-punk quality in this image. HDR can be highly appropriate here. 2) Always consider how much is too much. Remember what I had once said about histograms? Your goal should not automatically be to simply make sure there are no blocked shadows or blown highlights. Otherwise, you might end up with something like the topmost image - a dull and boring sea of grey. Ideally, you should process until about the point where an image still looks like it is not an HDR-rendered one, and then you can decide (if the scene is appropriate) whether you would like to push the boundaries just a bit more. I read about people taking 10 or more images at 0.3EV intervals then rendering them together. Overkill. You simply need to "read" the scene properly". If the dynamic range of the scene is not excessive, two or three images would be enough. You know what? 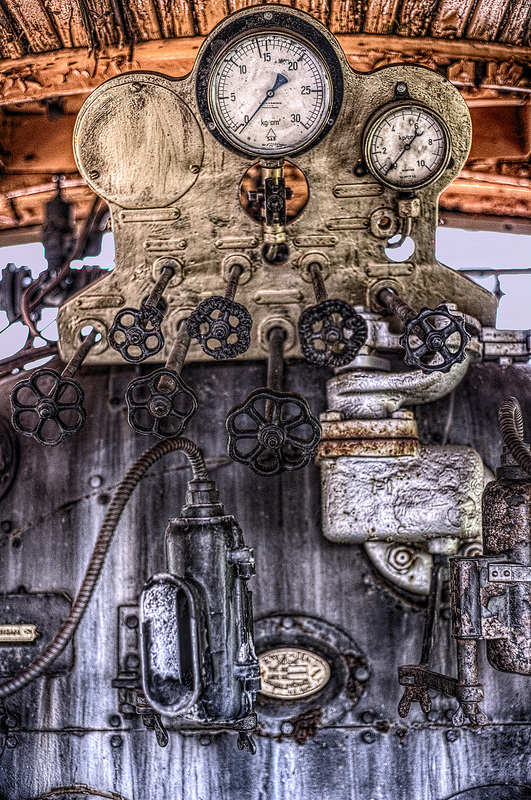 The locomotive photo just above is not even a proper HDR image - just a single image, tone-mapped! 4) Sometimes you don't need HDR at all. Let's say you're at the beach, trying to take photos against the sun. If what you try to do is to show detail on the foreground (e.g. the sand and the trees) without losing detail of the clouds on the blue sky, you don't need HDR. You need a Gradual ND filter! You simply put this on your lens, and voila, it all falls into place. Don't try to reinvent the wheel when the solution is something entirely different. 5) Last but not least, your processing should always serve your composition. Sometimes, overcast skies should be blown. And Always, an image is nothing without its content.